You can argue about the real costs of a machine. Some only calculate the costs of the installation and the immediate operating costs. We believe this is a very limited point of view. What happens when your weigher does not work properly or – worse still – stops working completely during production? Then the costs go through the roof. 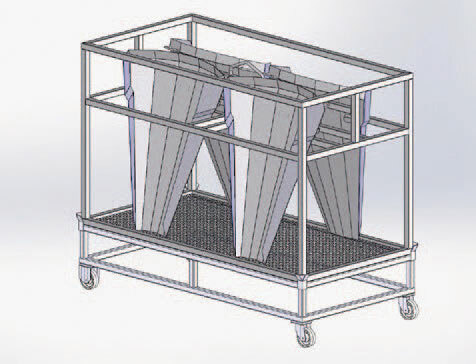 Admittedly, at multiweigh we have little experience with such events, because our extremely reliable multihead weighers are rarely out of order. In the odd event, they never stay out of order for very long, because our modular system concept, the possibility of extensive remote maintenance and service technicians who are available on short notice form part of a sophisticated service concept – made in Germany. We are so convinced of our products that we dare to do something: extend your warranty and maintenance contracts. Maintenance, spare parts and emergency service are included and at a fixed price. The best option is to extend the warranty, that immediately follows the contractual warranty. Hereby, our technicians ensure to accompany your multiweigh from its first “clack” and during its longest life possible. Provided the multiweigh is maintained continuously, it not only has a very long and profitable life ahead of itself – it also rarely gets sick, i.e. diminishing precision up to total failure. Demands on quality, reliability and investment security lead to one term: mechanical engineering made in Germany. This is what we are proud of at multiweigh. “Our customers appreciate the proverbial quality and reliability of our facilities. They know: this cannot be reproduced by competitors easily”, CEO Frank Schmehl is happy about the achieved goals. Even a multiweigh, which has not been maintained continuously, can regain access to the best service – with a maintenance contract. The contract is available at a fixed price, with or without parts. This allows for the highest possible business security. Our offers for warranty extensions or maintenance contracts are just as individual as your machine. Working closely together with you and based on your needs, the installed weigher, its age, the setting variables and efforts required we create an individual offer. Call us. In the rare event that assistance should be required, multiweigh’s technicians can also use the internet or dial-up connections to support customers day and night or to prepare for the optimal on-site customer service. In most cases, remote access and contact with the on-site operational staff is enough to keep production running. This optimizes time, staff and costs. As part of the food production chain, the highest hygiene standards apply to all multiweigh products. In addition to meeting legal requirements, our facilities are available with ingress protection (IP67 and higher). multiweigh has developed a unique cleaning concept for all our facilities which we would like to introduce personally to you. The multiweigh MW XV is particularly easy to clean in all versions. 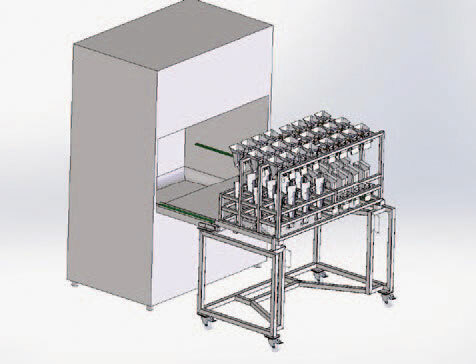 All product-contacting parts have a modular design and can be removed from the machine without tools. The disassembly as well as the assembly of the modules is possible without any service technician. For cleaning, the dosing and weighing containers can be hung on a washing wall, which is located near the weigher. Since the containers have no springs, the flaps are open for cleaning. Other product-contacting parts such as slide-downs are placed in cleaning scales. 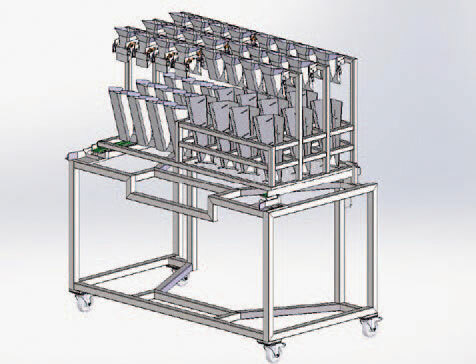 Since the multiweigh MW XV has a modular design in all versions, simply a second set of modules can be used during cleaning to continue production almost without interruption. All cleaning accessories are made of stainless steel and bead blasted. Alternatively it can be cleaned very quickly and effectively with an automatic cleaning system. For this, the cleaning trolleys are provided with a washing basket, whereupon the containers and gutters are placed. The washing basket can be put directly into the washing machine by the cleaning trolleys.